How cute! Would love to win. Thank you! What a cute gift card!!! I love your site and would love to win! Looks like a spring fever gift card! I like totally target on Facebook…and by like I mean LOVE!! This would come in really handy right now – thanks for the giveaway! 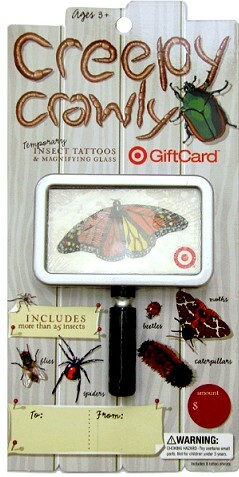 Love Creepy Crawlers especially on Target Gift Card. Thanks for offer. Like you on Facebook also! Leaving my comment! 🙂 Thanks for the chance! Thanks for the chance to win and all of the great shopping tips! Love it! Pick me, pick me!!! Love this offer; most importantly love Totally Target. WOW!!! Talk about a creepy, cool give away! This would be awesome to win, hope I’m the lucky one! great giveaway. Thanks for posting. Like Totally Target on FB an left a comment on that post and here. Love your site, would love to win! Would love a creepy crawly gift card! My son would love this gift card!